I'm new here, my interest is in building model boats/ships, I have a rough plan for a "Great Lakes Freighter" and the plan shows the bottom as being flat. Firstly is this correct ? and secondly does anyone have a photo of one in a fairly close up position and perhaps one in a dry dock ? Flat !!!??? I have no idea what you are looking at but, There are many reports of Great Lakes freighters running aground. What is the name of the ship you are modelling ?. Go here www.boatnerd.com and look through the pictures section there. Flat !!!??? I have no idea what you are looking at but, There are many reports of Great Lakes freighters running aground. Thanks for the link, I'll take a look. The plan doesn't have a name of any specific vessel, in fact it's not a really clear plan at all, I will try and take a photy of it and post it here soon. I think I may have answer the question about the flat botton with your link Thomas, thanks. 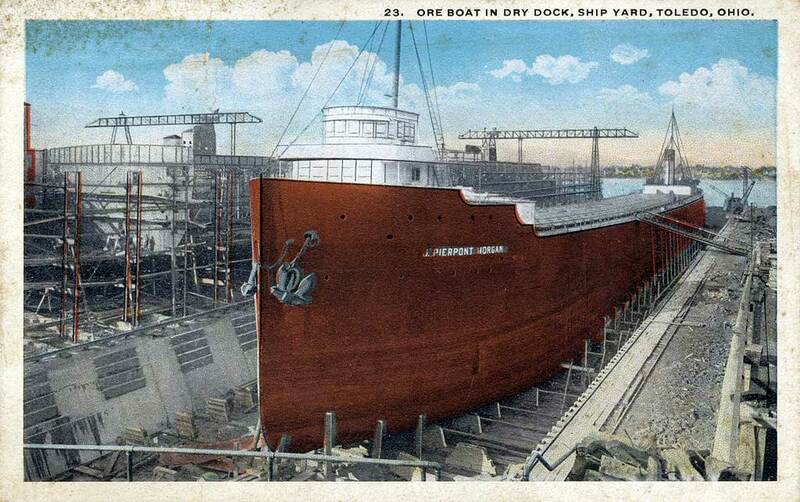 In this link is a postcard and it appears to show this type of ship with a flat bottom. Great lakes freighters have and rounded bottom which is why ports and channels have to be dredged deep enough for the bottom of the ship to safely clear the gorund otherwise the ship would run aground causing the ship to be most likely stranded and/or damaged. The only vessels that would have flat bottoms would be Mississippi River tugs and barges. No, all great lakes freighters have flat bottoms. Good evening, as a second engineer presently working on Great Lakes ships for 29 yrs, they are all flat bottom, I have attended many dry dockings. A lot of the newer vessels use Kort nozzles for steering but the new vessel for Algoma Marine all have rudders.